Description: This chubby little pig is on his way home from the candy store with a pocket full of edible goodies! 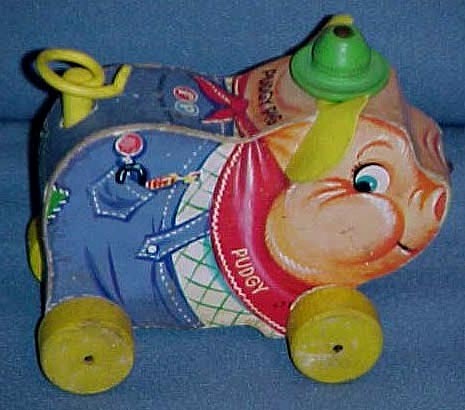 When pulled, he makes an "oink-oink" sound his curled tail spins around and around. FPT4235 - Wooden cut-out pig with paper lithographs on the sides and edges of a chubby pink pig wearing blue overalls with candy in the back pocket, a white shirt with green lines, and a red scarf marked "PUDGY" in white. 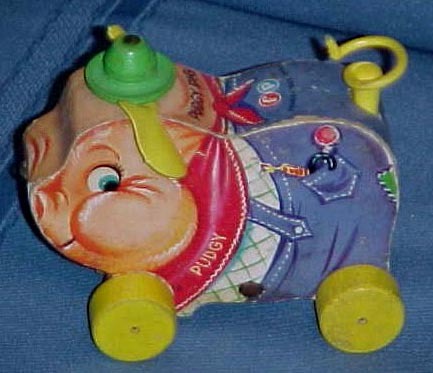 The pig wears a green wooden hat, he has big yellow flexible vinyl ears, a yellow plastic curled tail, and he rolls on 4 yellow wooden wheels. His tail twirls and he makes an "oink-oink" sound when pulled. Measures 5-1/2" long, 4-1/2" tall, and 2-3/4" wide. Also see 1959's #479 Peter Pig.